Neat theme—phrases that include an “in” replace the “in” by crossing the first chunk through the final word. The trick is that the final word of the phrase is formed by ignoring the first chunk’s crossing letter and making a new, shorter word. 3d. 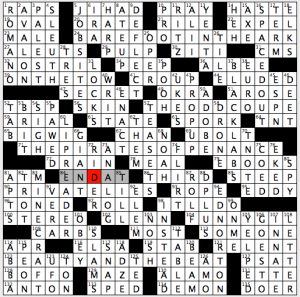 [With 18-Across, “To be on the safe side …”], JUST in CASE, where the word CAUSE (timely: 18a. [Gay rights, e.g.]) is pierced by JUST, and JUST’s U is ignored to make CAUSE into CASE. Crystal clear, right? If I knew how to color in my screenshot, I’d show it more clearly. 16d. [With 21-Across, remembering], KEEPING in MIND, part of 21a MINED. 30a. [With 13-Down, shorthand pact for a wild trip], “WHAT HAPPENS in VEGAS…”. 13d VEGANS sheds the N.
52a. [With 49-Down, 1995 Oscar-nominated Pixar theme song], “YOU”VE GOT A FRIEND in ME,” crossing 49d MOE. 80a. [With 58-Down, request for an official document], “COULD YOU PUT THAT in WRITING?” crossing 58d WRITHING. 101a. [With 90-Down, reacting to a gut punch, perhaps], DOUBLED OVER in PAIN, crossing the timely 90d Bristol PALIN (in the news this week for announcing her second pregnancy, still unmarried, and I don’t shame single mothers but perhaps this will make her a less appealing speaker on abstinence?). 87d. [With 104-Across, talking with a fake rasp, perhaps], CALLING in SICK, crossing 104a SLICK. 109d. 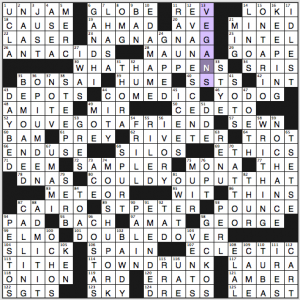 [With 125-Across, got the booby prize], CAME in LAST, crossing 125a LEAST. Did not know: 93d. [Physics Nobelist Martin, discoverer of the tauon], PERL. The scripting language Perl would have been a quicker get for me. Least welcome fill: “YO, DOG” (I expected “dawg” there), RRR, -ARD, SRIS, DDE … there wasn’t much that was jumping out at me. Pretty solid fill overall. “The Four Seasons” becomes DEFOE SEASONS, an [Author’s favorite singing group?]. Daniel Defoe, of course, wrote Robinson Crusoe. Wikipedia says Defoe “died on 24 April 1731, probably while in hiding from his creditors.” We should all be so lucky. “You go on ahead” becomes HUGO ON AHEAD, clued as [“I’ll catch up after I rest a bit,” to an author?]. I’ve been reading snippets from a translation of Victor Hugo’s Les Miserables for nearly two years now. I find it even more enjoyable than the musical (which I thought was great), though I can only consume it in small quantities. “Sues for damages” becomes SEUSS FOR DAMAGES, clued as [Takes certain court action, to an author?]. So yeah, Dr. Seuss was a writer of lots of stuff with few words. Forgive me, but I’ve never been a fan. When you grow up with the name Sam, you hear a few too many “green eggs and ham” jokes in your youth, to the point it dissuades you from sampling the Seuss oeuvre. “Ham it up” becomes HAMMETT UP, to [Overact, author style?]. Dashiell Hammett, he of lots-of-double-letters-in-his-name fame, is best known for creating detective Sam Spade and the crime-fighting couple, Nick and Nora Charles. We turn now to the theme entry that had me most flummoxed. Apparently, the last lyric in most verses from the song Dixie is “Look away! Look away! Look away, Dixie Land!” In this puzzle, that gets changed to LE CARRE! LE CARRE! LE CARRE / DIXIE LAND! I didn’t know the lyric, so with the first Le Carre in place I thought this was going to be something like LE CARRE ME BACK TO OLD VIRGINNY. When spy novelist John le Carre kept popping up, though, it really slowed me down. And I dunno, but with current events I’m not so sure that the de facto anthem of the Confederacy is the most appropriate fodder for wordplay at the moment. I’m sure the puzzle was sent to press long before the church shooting and related controversy over the Confederate flag, so I’m not blaming Merl–I’m just regretting the timing. “The Little Old Lady from Pasadena” becomes DELILLO LADY / FROM PASADENA, clued as [Author’s favorite song from the ’60s?]. I won’t pretend I know anything about Don DeLillo, writer of the National Book Award winner, White Noise. Luckily most of the crossings were easy enough, save for X-BALL, the [Popular variation of a game in which players shoot each other with paint-pellet guns]. 5. Let’s start with ARA, the [Palindromic constellation]. Here’s your handy study guide to A?A entries in crosswords: ABA if the clue references basketball or lawyers; ACA if the clue references Obamacare or asks for a Spanish word; ADA for clues using Oklahoma, Nabokov, or dentists; AGA for clues with Turks or Ottomans; AHA for cries of discovery; AJA for Steely Dan; AKA for alias, rap sheet, or anything police-related; ALA for menus, the word “like,” or the phrase “in the style of;” AMA for doctors; ANA for Santa, Ivanovic, or Gasteyer; APA for shrinks; ARA for constellations; ASA or ATA for fill-in-the-blank clues; and AVA for Gardner. 4. A HOFBRAU is a [German-style bistro]. 3. Here’s one we’ve seen before: ARUM is the [Calla lily’s plant family]. 2. A HOB is a [Fireplace shelf]. Favorite entry = RED ZONE, the [No-parking area]. This would have fallen earlier if I had figured out RAH as the [“Stranger in a Strange Land” author: inits.]. Obviously this clue was used instead of the more conventional [Cheer sound] because of the puzzle’s theme (an unfortunate choice, in my view). Favorite clue = [Rand’s dad] for RON Paul. Last week, we welcomed Mr. Bob Klahn back to the CrosSynergy fold, and now we get a Sunday Challenge from the man himself. I can’t remember every Sunday Challenge edition from Bob at this moment, but I’m pretty sure I had the most fun with this one more than any other Klahn Sunday offering. Would that be in part because of the yummy entries of BANANAS FOSTER (30A: [New Orleans dessert often prepared tableside]) and PANCAKE BATTER (35A: [This could turn into stacks of silver dollars])? Well, maybe! Thankfully, those two answers came pretty easily, especially seeing ‘stacks of silver dollars’ in the latter’s clue, as I immediately thought of pancake stacks. It had to be “(something) pancakes” or “pancake (something).” Have never had a Bananas Foster, but have heard of it a few times, and seeing that entry made it easier when getting one of its intersecting entries, SLEEPER, revealed the ‘R’ at the very end (13D: [Dark horse]). I have never heard of Sydney Lucas before, but seeing a four-letter entry for an award, I thought it had to be either ‘Tony’ or OBIE (21A: [10-year-old Sydney Lucas, for her 2013-2014 role in “Fun Home,” became the youngest person ever to win one]). I guess ‘Espy’ is another four-letter entry that’s also a name of an award, but that’s for sports, and I definitely would have heard of her if she was in the sports world. Speaking of the sports world, the answer that opened things up for me to begin the puzzle and get a good foothold to start was in the Northeast and John ELWAY (3D: [Quarterback in five Super Bowls]). I’m pretty sure he’s the only QB to play in five Super Bowls at the moment, as Tom Brady just played in his sixth Super Bowl this past February. Also in the Northeast, I’m sure a lot of you caught on to WALSH pretty quickly as well, especially with his first name in the clue (1D: [“Life’s Been Good” singer Joe]). I’m not sure if I like that or “Rocky Mountain Way” more from him. There really was only one answer where I was like, “Bob, what are you doing to me?,” and that was PHIDIAS (35D: [Sculptor of the statue of Zeus at Olympus, one of the Seven Wonders of the Ancient World]). Even BANGALORE wasn’t too much of a problem, as, once I thought of Indian cities and place names, I eventually thought of the Indian Premier League, the top league for professional cricket in India (30D: [“The Silicon Valley of India”]). One of the teams in the league is called Royal Challengers Bangalore, and when I saw that the couple of letters I had filled in for that entry jibed with the placement of those same letters in ‘Bangalore,’ it was a go. Interesting clue to IRA, as I’ve come across a few women named Ariana or Ariane, who also go by Ari (38A: [Man’s name, either way you look at it]). Now if I come across a woman who goes by Ira, then we’re in for something! 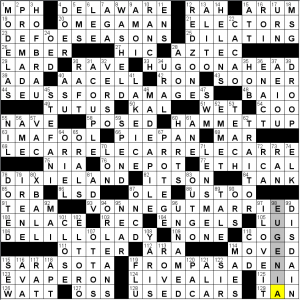 From the not-so-wayback-machine (about a month-and-a-half AGO (107d [Before now], standard delay for the on-line version of the CRooked/Boston Globe crossword), comes this Mother’s Day-themed crossword. But this one’s gender-neutral. So long as you’re famous and your first name (or nickname, or appellation) begins with the letters MA, you’re potential theme fodder. The gimmick here is that those letters are omitted from the entries. 23a. [“Ma” who schemed?] CHIAVELLI ([Niccolò] Machiavelli). 25a. [“Ma” who starred?] RILYN MONROE (Marilyn …). ‘Starred’? Kind of vague. No reason for the clue to be so terse. 38a. [“Ma” who bootlegged?] CHINE GUN KELLY (Machine Gun …). 48a. [“Ma” who won a Tony?] DELINE KAHN (Madeline …). 60a. [“Ma” who played hockey?] URICE RICHARD (Maurice …). 66a. [“Ma” who acted as a child?] CAULAY CULKIN (Macaulay …). Whoops. The strict boy-girl-boy-girl pattern has been ALTERED (70a). 80a. [“Ma” who played hoops?] GIC JOHNSON (Magic …). 87a. [“Ma” who was regal?] RIE ANTOINETTE (Marie …). 106a [“Ma” who led protests] HATMA GANDHI (Mahatma …). 108a. [“Ma” who sang] RIA CALLAS (Maria …). 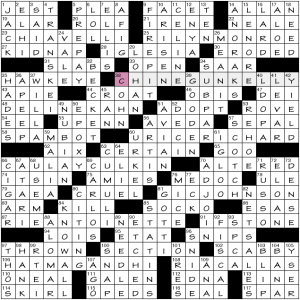 Male-to-female ratio of Mas in this ostensibly Mother’s Day crossword is 3:2. Hmph. Had I appreciated the theme before arriving at 53a [Politico Karl] I never would have tried MARX before ROVE. During the solve, I noticed writers Zora NEALE Hurston, EDNA Ferber, and WILLA Cather, which gave me the impression that there were a lot of women throughout the puzzle. So why not compile a list, see if it counteracts the theme imbalance? So, uh, that clarifies things, somewhat. Of course, deeper interpretation and analysis is feasible. But I’m stopping here. 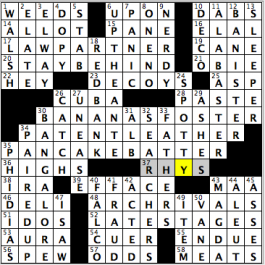 Kind of ironically amusing about Irene PAPAS, though, in this MA- crossword. Also, how do we feel about 22a [Author Zora ___ Hurston] NEALE and 110a [Shaq or Tatum] O’NEAL? 84d [Smarty-pants] KNOW-ALL. Check out the divergence in frequency of know-it-all and know-all since 1963 in this Ngram. Less-common words: 109d [Miscellany] ANA, 20a [Massage deeply] ROLF, 114a [Sound of bagpipes] SKIRL, 34a [Coal-rich region] SAAR (river), 4d [Region of South Africa] TRANSKEI (“the area beyond the river”). More riparian retinue: 105d [Belgian river] YSER, 49d [Of a Nile region] NUBIAN. Not part of theme: 36d [What the mum don’t make] A PEEP. Absolute least favorite fill: 99d [East Coast hwy.] RTE I. 53d [Chop the soil again] REHOE isn’t even close. Mis-fill: 58a [Junk e-mail sender] SPAMMER before SPAMBOT. Cluechos: 84a [Unreturnable smash] KILL, followed by 85a [Smashing] SOCKO; 1d [Royal flush card] JACK, 13d [Royal flush card] TEN (in turn cross-referenced by 52d [Prefix dividing by 13-Down] DECI-. Favorite clues: 83a [Sleeve insert?] 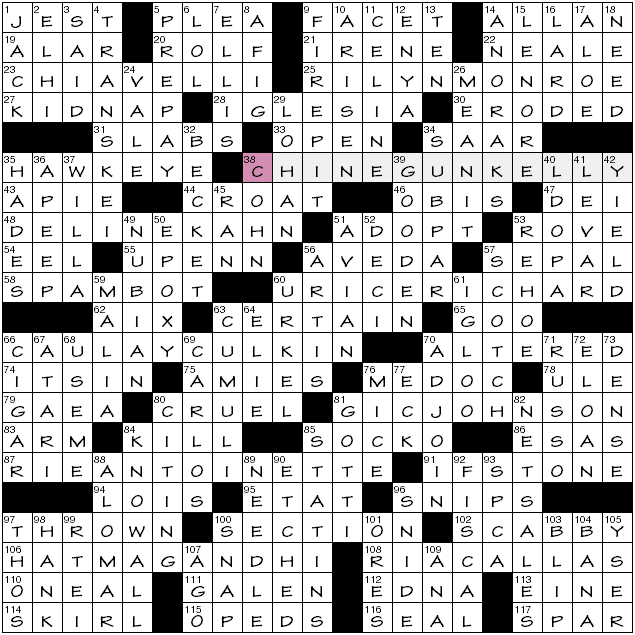 ARM, 62a [Provence town] AIX – remember, it’s a Boston-based crossword. 24a, BAREFOOT IN THE ARK [Show about shoeless Shem?]. Barefoot in the Park. Shem is (was, I guess) Noah’s son. Couldn’t use NOAH in the clue here because he’s in the grid at 68d [First name in lexicography], but we get some fun alliteration in the clue instead. 39a, ON THE TOW [Show about auto club service?]. On the Town. Not sure I’ve ever heard a tow truck referred to as a “tow,” and I’m not sure how else one would parse this phrase. Theories in the comments would be appreciated. 57a, THE ODD COUPE [Show about an unusual car?]. The Odd Couple. 71a, THE PIRATES OF PENANCE [Show about sorry predators?]. The Pirates of Penzance. There are a lot of words I would use as synonyms of “pirate,” but “predator” isn’t in my top five. Freebooter, raider, privateer, buccaneer… corsair? I guess those are my top five. 90a, PRIVATE LIES [Show about inventions in the military?]. Private Lives by Noel Coward. “Private Lies” sounds like a trashy ABC late-night drama that I would definitely watch. 122a, BEAUTY AND THE BEAT [Show about a pageant contestant with rhythm?]. Do we think the constructor knew about this song before making the puzzle? Pretty funny theme, but only seven theme entries, so you’d expect some nice long fill holding up the rest of the grid. Sure enough, there’s tons of good stuff: JOB SITES, SPACED OUT, BLACK LABS, TEA SETS, LIP READER, MINECRAFT, ED NORTON, BIGWIG, BOFFO. Nothing jumped out at me as bad fill, though I noticed U-BOLT crossing T-NOTE. I liked the clue for MALE [Man, for instance]. 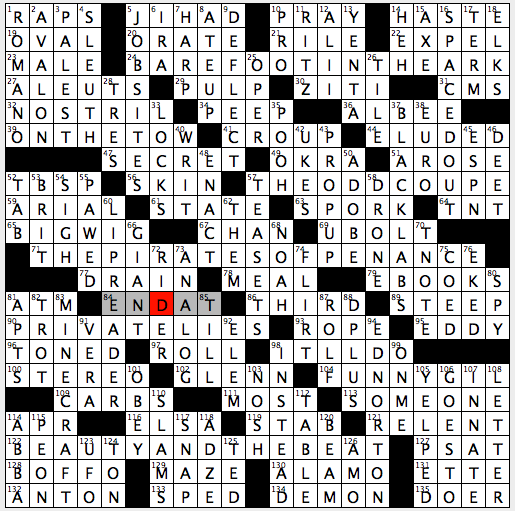 Clever without being “edgy.” The crosswordese ETTE got a nice clue with [Rock follower?]. Everything an easy Sunday should be, in my view. 4.1 stars. Until next time! This entry was posted in Daily Puzzles and tagged Bob Klahn, Emily Cox, Henry Rathvon, Jeremy Newton, Jim Quinlan, Merl Reagle. Bookmark the permalink. NYT: Yes this was awesome. Best one in a while. I had “cigar bar” for OPIUMDEN at first so that threw me off a bit. But the theme was well executed, the clues were great & it had a solid fill. Loved Merl’s puzzle, although it took me the longest time to parse DELILLO into “The little old …” Finally saw (mentally heard?) “the lil’ ol” but I’m pretty sure the Beach Boys and Jan & Dean pronounced all the syllables. CRooked – Agree with the meh rating. Once I figured out the twist, which didn’t take particularly long, filling in all of the theme answers was pretty easy. I almost quit at RTEI. ALA could also be a wing (though Shortz hasn’t used this route for the singular of ALAE); AMA and ANA can also be FITB’s [and “ANA” is also a cheerleader’s request]); and ALAs the most common clue for ARA is via some sportz dude who apparently last coached football 40+ years ago (and even his afterlife as an announcer ended back in 1988). 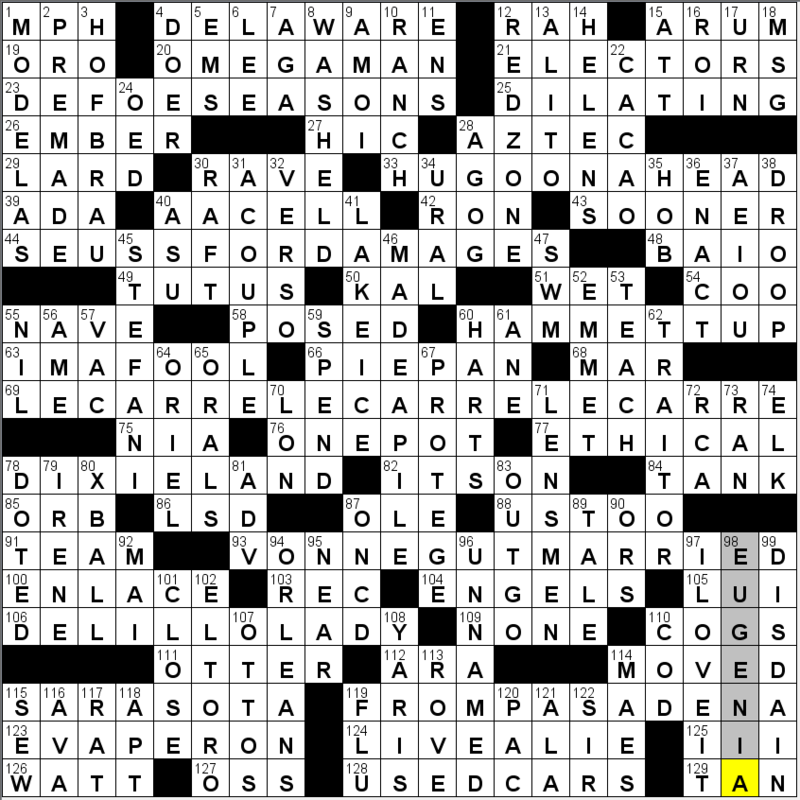 I thought today’s trio of NYT, LAT and HEX were all really enjoyable puzzles. “Meh” has become as much crosswordese outside of puzzles as it has within them. I find its overuse amusingly ironic, since crosswordese is so defiled on these pages. It’s my understanding that crosswordese refers to those terms that have little life beyond the rarefied perimeters of crossword grids (and of course the relevant scientists, historians, subcultures, et cetera to whom they are endemic). So how can something you seem to suggest is pervasive and overused constitute crosswordese? p.s. I used meh as my summation in part because it sounds like “Ma.” Hope that was clear. I think the next time MEH appears in one of my puzzles (actually, I’m not sure if it has). June 28 BobKlahn — glad to have him back! “vane” for a wind instrument took a long time, and using “BAA” instead of “MAA” loused up the rest of that corner. the “silver dollars” clue was clever, and i was glad to get it. just now got “IRA/ARI” — i’d been looking for a palindrome. live and learn.